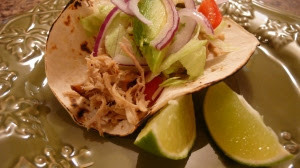 This is a really simple recipe for pulled pork filling for tacos, enchiladas or quesadillas. It can be made in advance and reheated, is even better the next day and can be frozen for later use. I often make it the night before and put it in the fridge. Then, in the morning I put it in the slow cooker on low so it is hot and ready when it's dinnertime! Start with a large pork roast or pork tenderloin. Season with kosher salt, pepper, cumin, a small amount of chili powder and a sprinkling of dried oregano. Get a large saucepan screaming hot. Sear (brown) all sides in some olive oil. Enough chicken stock to come 1/4 of the way up the sides of the pork roast. Bring everything to a simmer. Cover and either braise on stove top on low - medium. Or, you can braise it in the oven on 350 degrees. Cooking time for either will vary depending on the size of your roast, but plan on a few hours. You'll be looking for a doneness point which allows for the meat to be easily shredded. Once you have achieved that, transfer pork to a cutting board and shred with a fork. Return meat to pot and mix cooking juices with meat. If the liquid that remains makes the pork look too "loose," simmer on the stove for a bit to evaporate some of the liquid. You're looking for moist, not soupy. Check at this point to see if you need a little more lime, salt, pepper or cumin. Adjust to your liking. For tacos, serve with tortilla or corn shells, shredded cheese, shredded lettuce, cilantro leaves, lime wedges, diced tomatoes, sour cream and/or guacamole. Or, pork can be used in your favorite enchilada recipe or used to make quesadillas. This recipe works extremely well in the crock pot! Yes, I have done it in the slow cooker after searing the meat first. Anything that can be done in advance is a PLUS in my book! Thanks for sharing! And, thanks for visiting! I love this in the slow cooker, too! I'm glad you loved it. Thank you for your feedback!